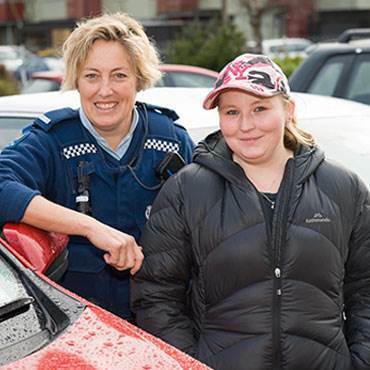 Constable Sara McLauchlan has volunteered to mentor 24-year-old Jasmine Giles through the new Community Driver Mentor Programme in Christchurch. With Porirua, Waitomo and Gisborne showing success in the Community Driver Mentor Programme, Christchurch is the fourth region to roll it out. It focuses on drivers aged 16-24 that don’t have access to a licenced vehicle and can’t afford enough driving lessons. The drivers are paired with a mentor who takes them for a supervised drive. The mentors are unpaid volunteers from the community who act as coaches for up to two hours per week. While they are not driving instructors themselves, they have received professional driver training from a driving instructor. Overseas research indicates that the more practical experience a driver has, especially in a wide variety of conditions, the better their driving will be once they pass their test. However, driving lesson costs can mount up, and some drivers don’t have any access to a licenced vehicle or the money to pay for petrol. The Salvation Army Education & Employment is the community partner running the initiative in Christchurch. It also helps young people find employment, and having a driver’s licence makes people more employable. “Often a restricted licence is all that stands between a young person and their first job,” said Deborah Peters, The Salvation Army’s Education & Employment National Operations Manager. Supporters of the programme include Caltex which provides fuel for the cars, AA which provides three lessons for free, the Transport Agency which provides the car, and NZ Police. Chevron New Zealand, owner of the Caltex brand, has committed $100,000 to the current programme.